It’s been an exciting and educational last few months for Project Rousseau’s Broadening Horizons pillar! From museum trips to movie screenings to art workshops, students have experienced a variety of cultures hands-on, and have taken away important lessons from these excursions. In the months of January and February, students were particularly exposed to social justice issues through film. Students were able to attend a private screening of two films from the African Film Festival. These films gave students a glimpse into the lives of women in Senegal and even were able to hear the producers speak about the film! Students have also started attending a weekly educational film night in our offices - last week students watched The Seventh Seal, a Swedish film regarding philosophy and existentialism. The list of movies scheduled includes documentaries, other foreign films, and classic blockbusters - so students will be exposed to a wide array of perspectives and cultures! Students also tuned into a live talk about the Black Lives Matter movement in New York City public schools, as we held a viewing party in the office. Project Rousseau students felt especially connected to this talk, as it regarded an issue directly happening in their schools and lives, and we were able to have a productive discussion about the movement. Outside of film and speech, students also were able to visit multiple New York City institutions. We visited the Metropolitan Museum, a classic, and the lesser-known Museum of the Chinese in America. Students were excited to explore exhibits related to their own cultural background and were especially amazed at seeing the actual artifacts that are in their history textbooks, in real life. Another hands on experience occurred when we visited the International Print Center. Students were able to attend a printmaking workshop with a professional print artist, and everyone went home with evidence of their hard work! Overall, the winter Broadening Horizons excursions blended entertainment and education in a way that really connected with students, as we experienced high turn-out and engagement levels. The Broadening Horizons pillar is fundamental to Project Rousseau's mission as it exposes students to a range of issues, experiences, and potential life paths that may have remained closed off to them. We are very much looking forward to the programs that spring has in store! Project Rousseau is excited to announce the launching of our Pre-College Success Program - a multiple-week course designed at teaching junior and senior students the skills they need to thrive in higher education. The Pre-College Success Program was designed after Project Rousseau considered the challenges in transitioning from high school to college that our students currently in college have encountered. It intends to preemptively correct or ease up on these challenges, by teaching our current high school students the skills that college students need to develop upon matriculation. It is especially important to Project Rousseau that our students not only get into college, but succeed while in their undergraduate years, and we aim to support them throughout by building up a foundation of tools and knowledge that they can use over the next four years and life. The program will take place for twelve weeks of two hour sessions and it started on Friday, February 22nd. The Pre-College Success Program includes eight sessions on writing research essays and four workshops on topics such as drafting emails to professors, adjusting socially to college, managing finances, and selecting classes. Currently, six students are enrolled in the course, with hopefully more to be added as it picks up popularity and success. The first session focused on improving the writing of basic sentences - and while this sounds simple, students spent the full time working on improving their sentence structure, with a second session to come! Students Assul and Carolina were particularly intrigued with the concept of “nominalizations,” or verbs that have been changed into nouns. Both students spent ample time correcting various New York Times articles that used nominalizations, and rewrote them with active verbs instead. Student Jahnya is particularly excited to take this new skill of making her writing more dynamic and to use it while writing academic work in college! Overall, students found the class to be helpful and worthwhile, and they plan on incorporating these writing skills into their current work and future college assignments. Next week, we will focus on the sentence again, and then we will switch over to learning more about practical skills such as reaching out to professors through email and office hours. The Pre-College Success Program is off to an exciting start, and Project Rousseau looks forward to seeing the impact it has on our students’ achievements. In its 6th year, the London Exchange program from January 12th to 21st was once again a massive success, with six students traveling across the pond to tour universities, visit museums, and experience cultural differences between the United States and Great Britain. As a part of Project Rousseau’s Broadening Horizons pillar, many students who have never had the chance to travel abroad before are able to visit another country and educate themselves on the education, history, and culture of their exchange peers, in this case, from St. Paul’s School for Girls and the City of London School for Boys. On the London trip, students were able to visit Oxford University, experiencing a different type of education than what they are used to in the United States. Our student Taina particularly appreciated the seminar-style class structure. Maya’s favorite aspect of the Oxford tour was its food, surprisingly! Overall, our students absorbed the work ethic of their British peers, and hope to take this style of learning back into their classrooms here in the US. Another exciting aspect of the Exchange was in visiting many historical spots in London and also in visiting many of the city’s most renowned museums. Students visited an Anglo-Saxon exhibit in the British Library, learned about the World Wars at the Imperial War Museum, and even saw the Rosetta Stone in the British Museum! Muntafa even visited the Lord’s Cricket Ground! To promote hands-on learning about government, we spent a whole day in Parliament, sitting in on debates. Many students made the connection between what they learn in their government courses and what was happening on the Parliament floor, so this proves it was a very worthwhile experience! Clearly, the 2019 London Exchange was a success, with students not only learning about the history and education of their British peers, but interacting with them on a deeper level and gaining more cultural understanding. Project Rousseau students with their London peers. 2018 has been another spectacular year for our students. We have seen inspiring firsts in all of our academic outcome metrics, in higher education admissions, and in all of our new programming. We have seen equally inspiring work in continuing our programming from 2017. Our students never cease to amaze us and create a great sense of pride in our staff and –most importantly of all- in themselves. We invite you to look through our Annual Report to learn more about what our students have accomplished in 2018, and to see the extraordinary futures that they are creating for themselves. Most importantly, our students’ successes would not be possible without your myriad forms of support, and we look forward to seeing you continue to be a part of our students’ lives. We had a great time Hearst Tower last Thursday editing our college essays and other applications. As you can see we had a very exciting list of goals for the evening, from submitting Harvard, Duke and Princeton applications to registering for the TASC High School equivalency test. All of our students worked extremely hard to meet their targets. We were also very pleased to have a number of our alumni join us to help with editing and share their college experiences with us. Thank you very much to Mark and Maureen at Hearst's Office of General Counsel for hosting us. We are extremely excited to announce that Jahnya has matched with Dartmouth and will join a number of our alumni as Questbridge Scholars. Jahnya has worked extremely hard during her high school years to get to this point. We are very proud of her dedication to SAT Prep, Community Service and Broadening Horizons that has helped her get to Dartmouth! Jahnya has had the most of the many exciting opportunities and ample support she has received through Project Rousseau. In the last few months alone she has interned at the European Parliament, lead our Global Issues Network team and, of course, worked very hard on her college applications. Jahnya says "Austin (Project Rousseau's Academic Coordinator) really helped me separate my ideas for my essays and it allowed me to see what I really wanted to emphasize. His help has really meant a lot to me, I know that has helped me more than anything else!" Congratulations Jahnya! We are very proud of you and your hard work. We look forward to supporting you in the next, exciting stage of your education at Dartmouth! 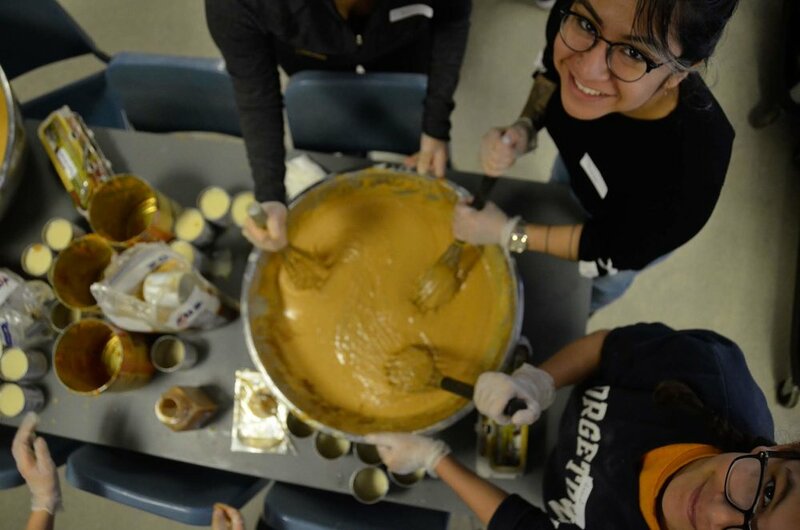 This year marked Project Rousseau’s 7th Annual Pie Day. Over 75 volunteers gathered together to bring the holiday spirit to local homeless shelters in NYC. As crusts were rolled, apples chopped and pies filled the room became filled with more laughter, fun and a deep sense of pride and accomplishment. In the end, we had yet another record-breaking year with 646 pies baked and distributed to the homeless. Despite the hectic day, we paused to take a moment to honor some of the hard-working members of the Project Rousseau community. Alejandro Zarate, a member of the Project Rousseau family since 2013, was awarded the Zach Brokaw Award. This award is named in honor of a volunteer who passed away in 2015, and the exceptional commitment and care that Alejandro has shown towards our students resonates in every way with the way that Zach supported those he served. This year’s recipient of the Jean Prendergast Award for Excellence in Community Service goes to New York City student Assul! 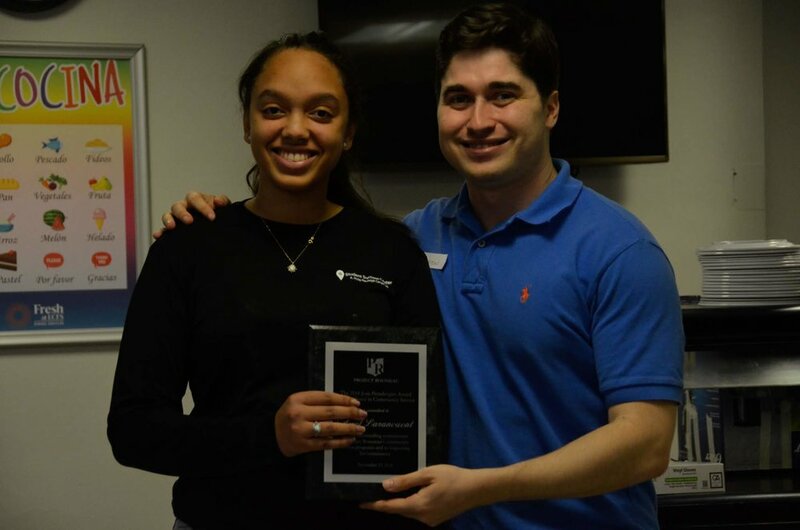 Over the past year, Assul has gone above and beyond expectations in community service. Not only has she attended Project Rousseau community service events, but she pioneered a STEM mentoring initiative for middle school students near her. Assul, a lover of all things STEM, felt that her own STEM education could have benefitted from a mentor, leading her to create an opportunity for younger kids to learn more about STEM. Assul has displayed motivation, resourcefulness, and a sense of creativity that namesake of the award Jean Prendergast would be proud of! We want to congratulate both our recipients as well as all our student and adult volunteers who helped make Pie Day 2018 our biggest one yet. September marks the start of the new year for Project Rousseau. This month we have been pleased to welcome many new students from our partner schools who have enthusiastically engaged in many of our programs. We have had a particularly busy month for Broadening Horizons activities, often a favorite for our new students who are exploring their local area and the opportunities within it for the first time. We started the month with a trip to the Natural History Museum Planetarium where they were able to experience the incredible astrophysical resources that are available at the Hayden Planetarium. The students enjoyed viewing the depths of space from right here in NYC! Next, we combined our Community Service and Broadening Horizons pillars as our students were invited to attend the 2018 Peace First Summit based on the positive work they have been doing in their own communities here in NYC. The day was focused on young leaders who are working to create a brighter, more peaceful future across the world. A selection of trailblazing young leaders took to the stage to speak about their pain, triumphs and the ways they have learned to use compassion, courage, and collaboration to create lasting change in their schools and communities. There was also a number of amazing performances by musicians and dancers from across the country, showing just what you can achieve if you put your mind to it! It was an incredibly inspiring day full of great ideas, initiatives and hope for a brighter future! The month ended with a visit from our Danish partner school, Rysensteen Gymnasium. Project Rousseau Student Leaders had an amazing time greeting and touring our 24 Danish student visitors around Harlem. Student Leaders took the visitors to Washington Heights and Manhattanville to teach them about the vibrant history present in the two areas. Along the way, they visited a few local parks and showcased some of the significant works of graffiti art. The students had an opportunity to discuss the meaning behind the publicly displayed works. Additionally, the Danish students were able to see Harlem’s world famous Apollo Theater. After a long day of lively learning and conversation, the students ate together at Tom’s Diner, where they took a group photo to commemorate the eventful day. The annual visit from Danish students is a wonderful Project Rousseau tradition that creates meaningful bonds between internationally diverse students. The summer may be here but that doesn’t mean the hard work stops for our students. While many of our students have been discovering new countries, their peers have also been making the most of what Project Rousseau has to offer in their own communities. Throughout the summer we offer a drop-in program for students. This can include anything from extra SAT prep to help signing up for soup kitchens. 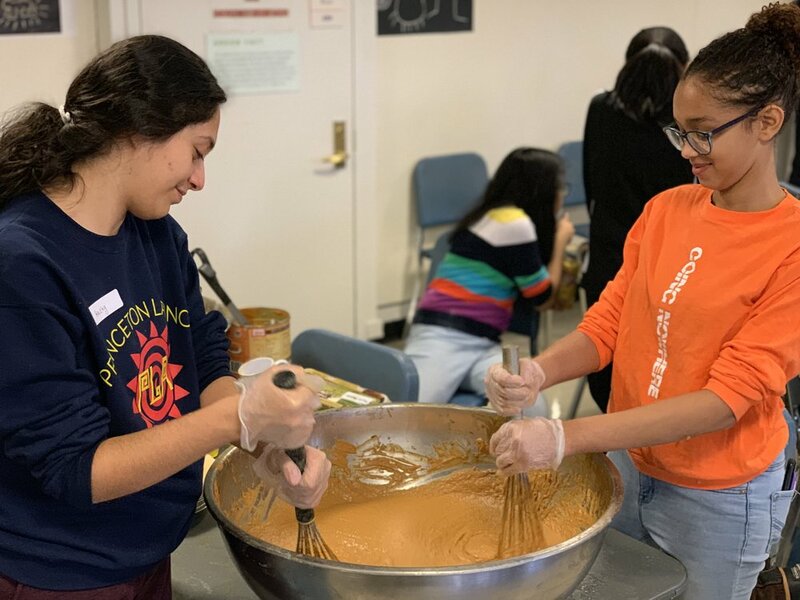 Summer hunger and safety in their own neighborhoods are often problems for many of our students and for that reason we make sure that all of our summer programs offer even more free food than usual and a safe, quiet place for those who need it. Drop-in time also allows for students to work together. Here at Project Rousseau, we really value peer-to-peer tutoring, below Chinelo is helping her peers with some schoolwork. Peer tutoring is such a useful tool that can aid both the teacher and the student. By helping the other students, Chinelo is further solidifying her knowledge in a specific subject, and the other students are getting help from someone they can relate to. We have had a number of older Project Rousseau students participate in peer tutoring over the summer and they have all done a great job! Additionally, our Broadening Horizons pillar continues throughout the summer. The extra time allows us to expand beyond our usual sites. Recently a small group of Project Rousseau students recently enjoyed a day trip to Princeton University in Princeton, New Jersey! The students had the opportunity to explore the beautiful campus via a student-lead tour and also attend an information talk on undergraduate programs and entry requirements. Despite the on and off rain, it was a great day, where everyone learned a lot and got some great pictures too!